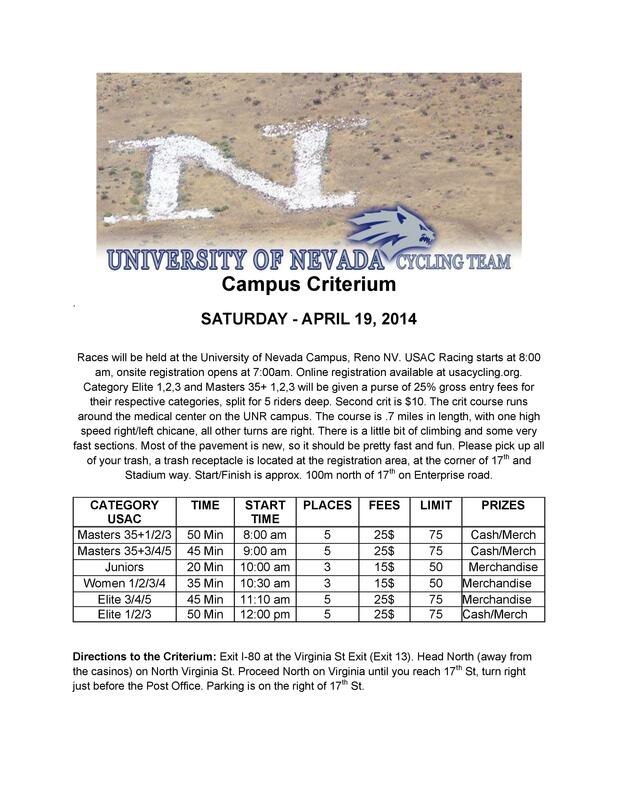 In just a few weeks, our annual Campus Criterium will be going off on the University of Nevada, Reno campus. There will be prizes donated by local businesses for top finishers and the Pro class will even have a purse! Racing starts at 8:00 a.m. so make sure to show up early enough to register and get warmed up. We hope to see you there! Want more details? Click on the Campus Criterium tab for the full race flier and course map. 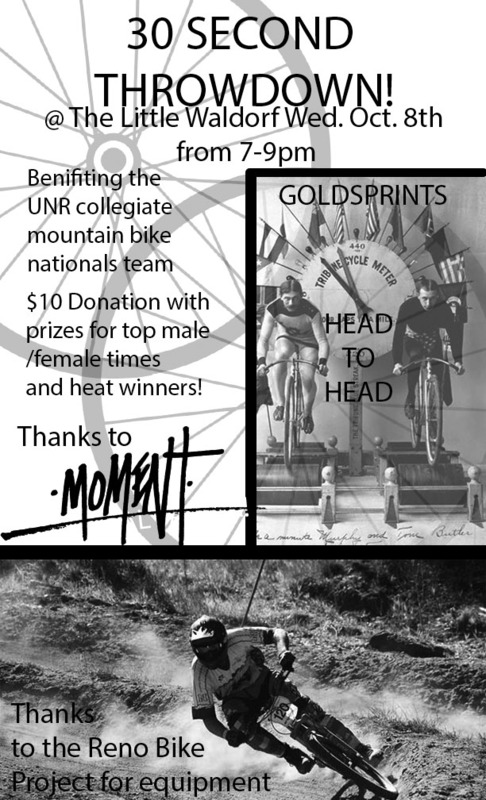 Come support the Nevada cycling team by coming to the Wal Wednesday 10/8 for our Goldsprints fundraiser! 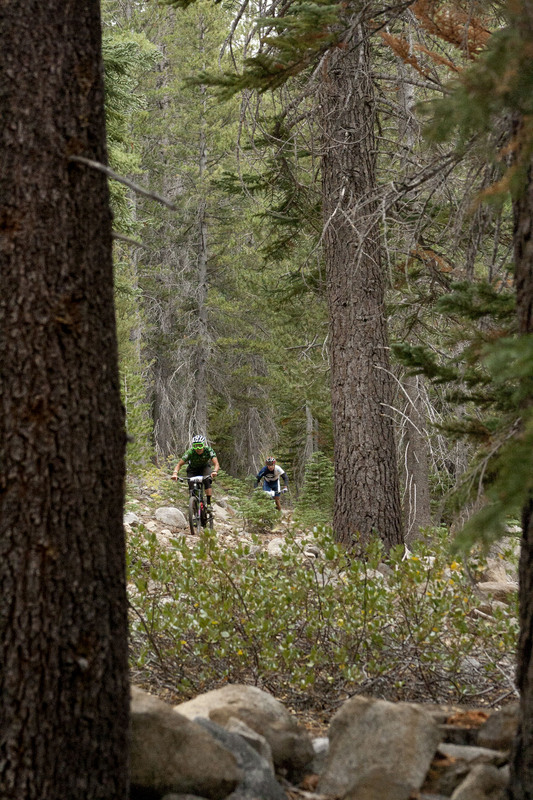 The 2014 Sky Tavern Sufferfest on 9/27-28 has come and gone again. It was another great race despite cold and wet weather. 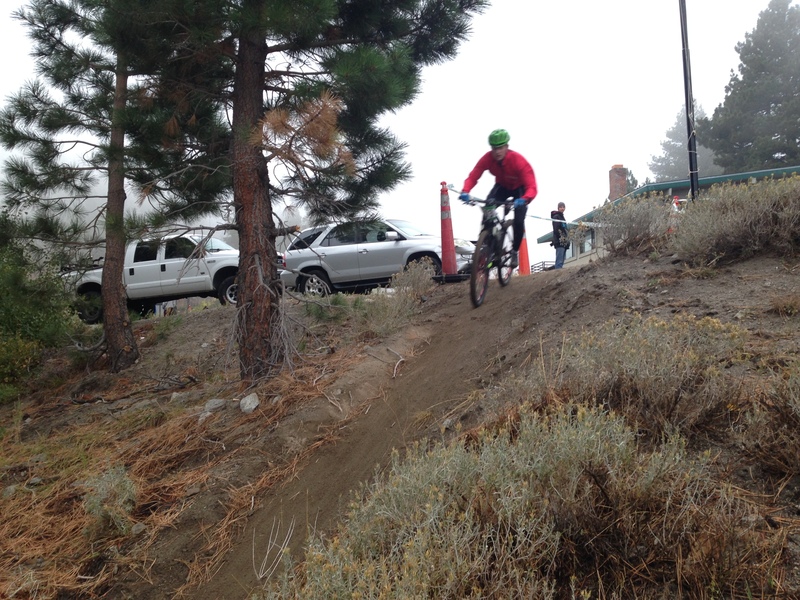 The trails and the duel slalom track were in great condition!. The day kicked off with the cross country course. 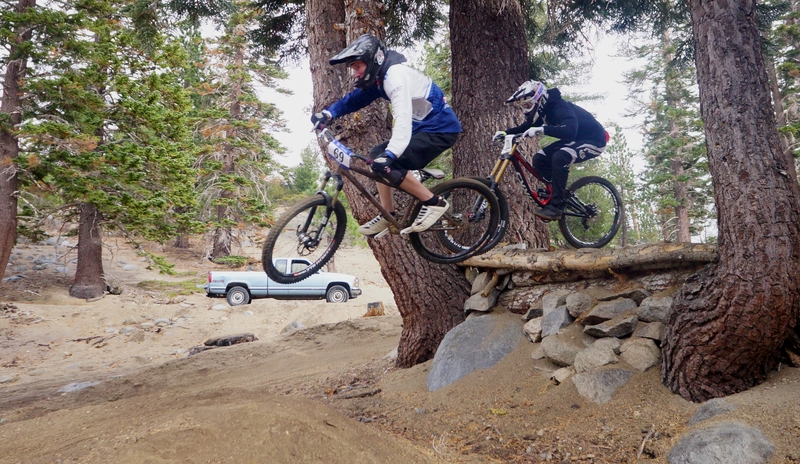 With 6 mile laps with 1000 feet of vertical riders were in for a challenge! 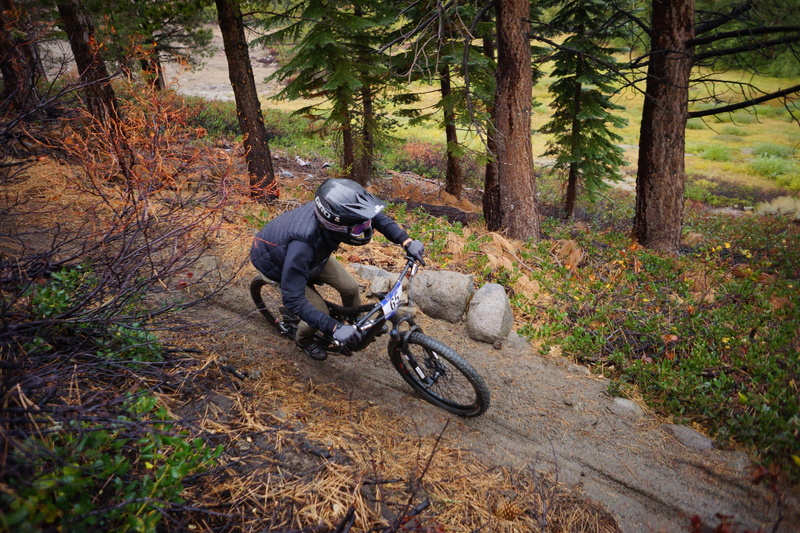 Nevada’s own Erica Grief took the win in the women’s A race on a borrowed mtb for her 1 mtb ride a year! Matt Fanfelle was just off the podium in 4th place for the Men’s A race. In the Men’s B race Tyler Toulouse took 2nd with Alex Provan just behind in 3rd. In the C’s race Nevada swept the podium with Caesat Medina, AJ Smith, and Matt Hirni going 1,2,3! The DS course was in top shape for the afternoon as mother nature decided to give use some rain! This was the biggest event of the weekend on arguably the best track in the west coast. 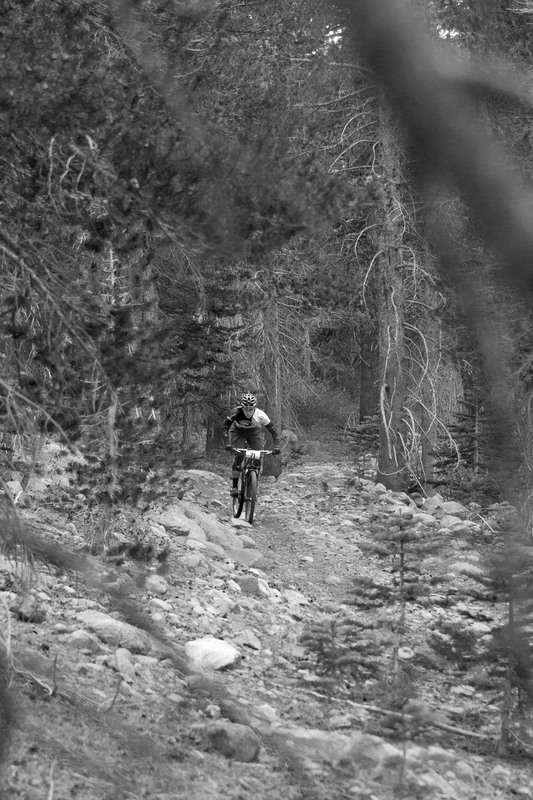 Spirits were high and the stoke factor was through the roof. In the Women’s B race Nevada’s Megan Ludwig got 3rd. In the Men’s A race Tyler Hansen barely missed out on the top spot coming in 2nd. In the B race Tom Stuer aka TOM SMASH went 2nd and AJ Smith came in 4th Caesar Medina and Aaron Anderson took the 1 and 2 spots in the C race! 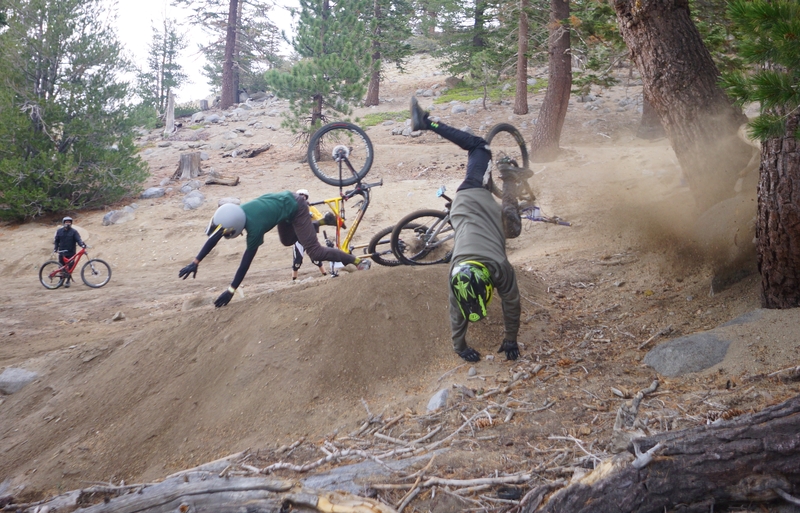 Oakley Erickson (below) had the gnarliest crash of the race as he duked it out with Steven Pearl! Luckily Oakley came out of the wreck only a little sore. 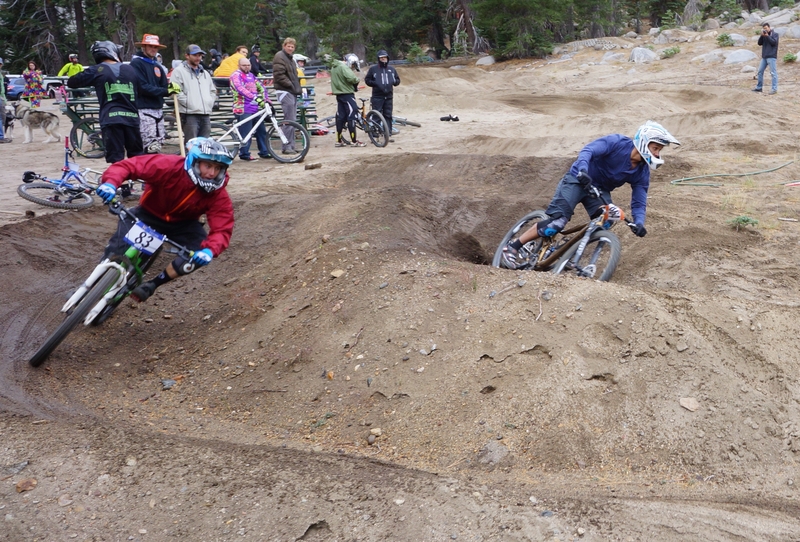 The Short track kicked off the day on the brand new track that had riders smashing around the Sky Tavern lodge. The cold weather had hecklers from inside the building shouting out at racers. In the Men’s A race Curtis Duncan took 4th and Alex Provan got 4th in the B race! AJ Smith took 2nd in the C race with Caesar Medina coming in right behind in 3rd. New team member Alex Provan showing lots of promise to be a top level endurance racer! 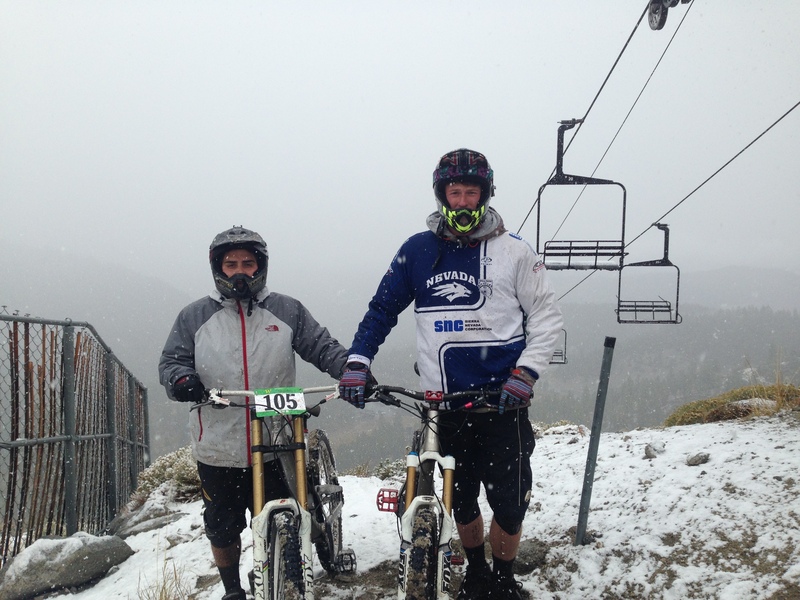 The afternoon was the DH race. Blizzard conditions left riders going up for 1 practice run then coming into the lodge to by hot chocolate. The cold weather scared some teams away but not Nevada. Oakley Erickson went 2nd by 1 second in the men’s A race! Tom Stuer was 2nd in the B race and Aaron Anderson was 2nd in the C’s race. During practice snow began to stick the course. 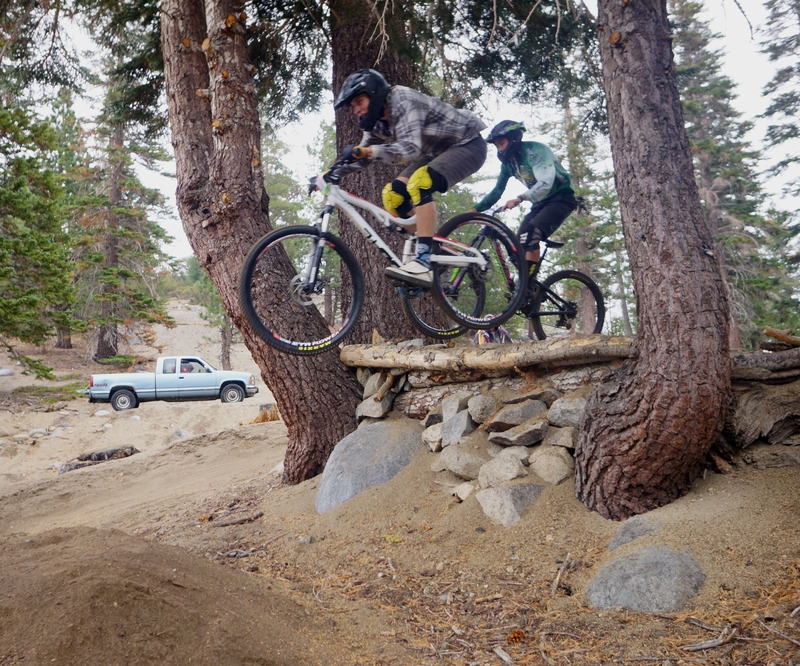 Tom and Kevin were having an awesome time riding these unique conditions. 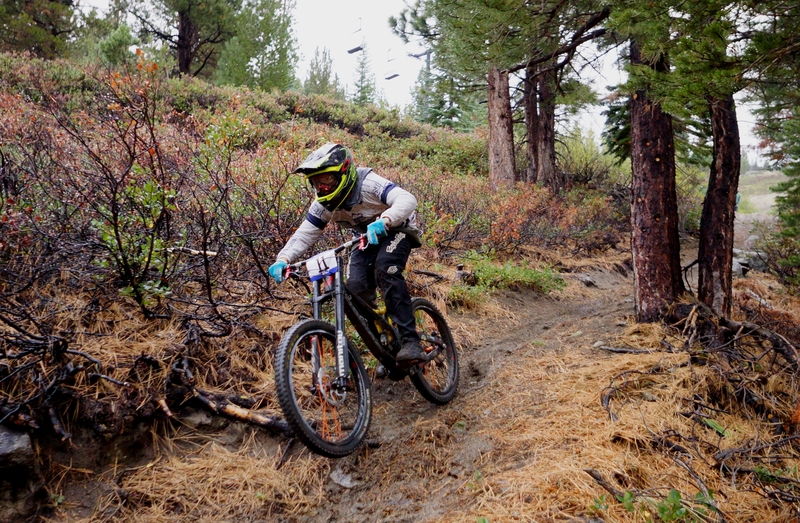 Oakley Erickson was wicked fast coming into the last and fastest section of the course. Great race weekend for Nevada! Big thanks to Bill from Sky Tavern and Casey Coffman , Nevada alumni, for making the race happen! Thanks to all the volunteers that make this race possible without you we could not do it! Finally, a big thanks to all our sponsors! UNR Campus Crit returns on April 19th! 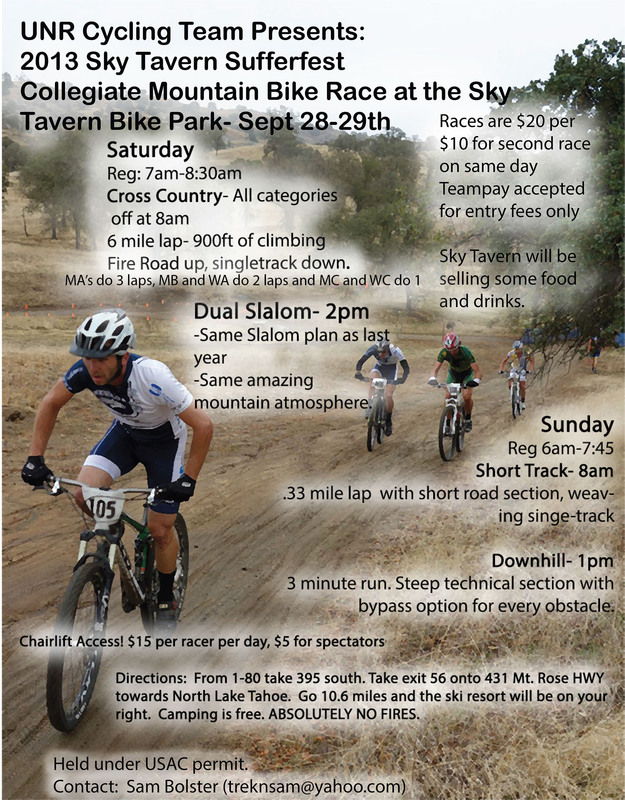 Here are the fliers for our upcoming home mountain bike race, hosted at Sky Tavern Resort. 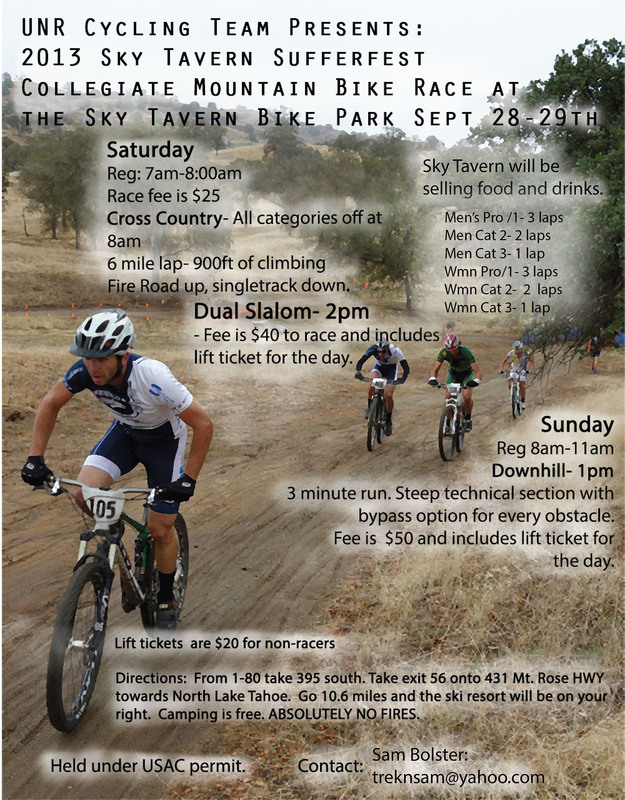 It’s gonna be a great time, with collegiate and non-collegiate riders! Tell your friends! Fall semester will be starting soon. 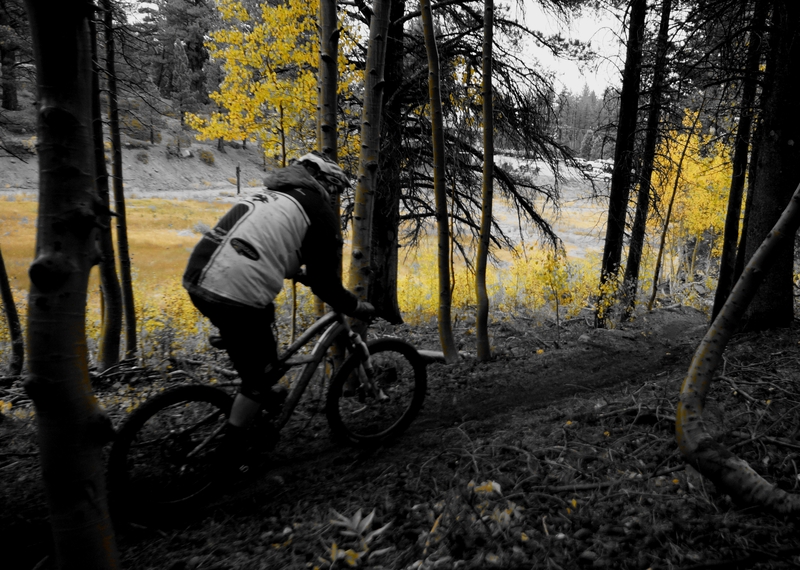 Which means MTB season is starting soon. Which means that the 2013-2014 schedule has been updated to reflect upcoming events with the team. Which means its time to get pumped! Big thank you to a newly acquired sponsor, Safeway, who has been added to our sponsors page. Thank you so much for the support! 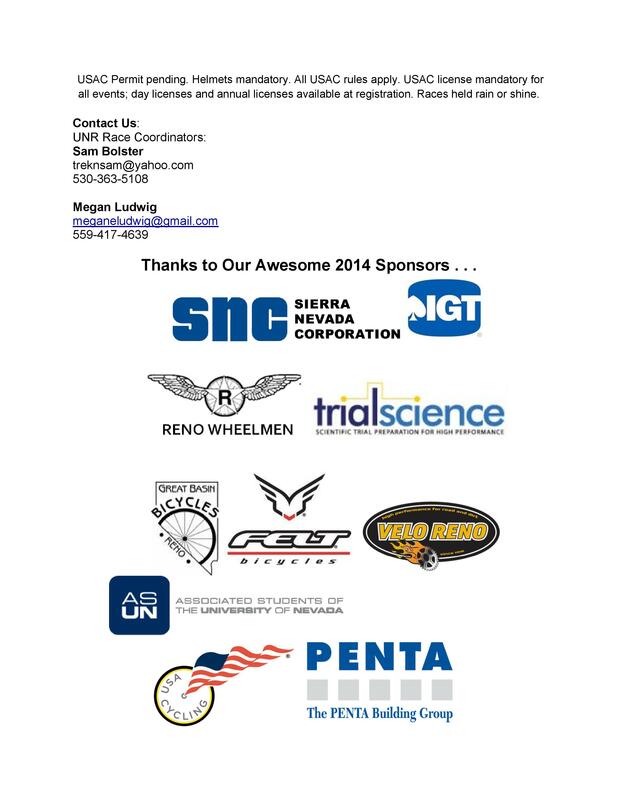 This week will be the Twilight Stage Race hosted by our sponsor the Reno Wheelmen. This comprises of 3 consecutive days with events each night.